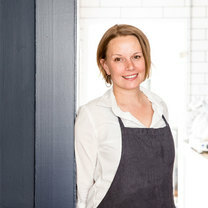 Chef Melissa Perello is the chef/co-owner of Octavia and Frances. In 1994, she attended the Culinary Institute of America. Before opening her first restaurant, she worked at Fifth Floor in 2006 as executive chef, which went on to win a Michelin star. In 2009, she opened her first restaurant Frances, which quickly gained a Michelin star once more. 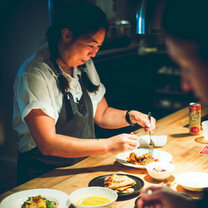 In 2015, she opened her second restaurant, Octavia. Fabulous vermouth cocktails. An 8 o'clock rush. No dessert orders. 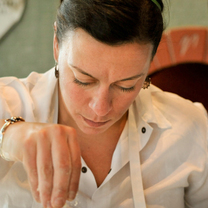 Experience the first night of service at chef Melissa Perello's Octavia in San Francisco. Opening Night immerses you in the rush of the unknown, as restaurants around the world open their doors for the first time. These things only happen once. Snag that coveted seat at the line, on us. "With Alfonso Oloroso sherry, Barbancourt rum, and pecan bitters, this drink is tasty. It's part of their seasonal Sherry Christmas menu." "The trouble with most places like Nopa is that they change their menu almost daily, but the good thing is that they always have some type of flatbread on the menu. Baked in their wood-burning oven, it has a great, crisp texture and always comes with fun flavor combinations. If their cauliflower salad is on the menu, order that, too!" "Aside from the fact that they are delicious, it's just a creative preparation, from the crisp of the brick dough to the combination of the crème fraîche and lime zest. I could eat a thousand of them." "These eggs have an intriguingly smokey flavor. I love the slight pickle and spice of the jalapeño, as well as the little, crisp bite from the bacon chip they place on top of the egg." "I love the chicory salad because it hits every standpoint from flavor and texture. There is so much dynamic to this dish—sweet from the date vinaigrette, bitter from the chicories, and salty and crunchy from the crispy chicken skin. It's just plain delicious." "thanks @brand_ino for the delicious treats"
"apple G A L L E T E meyer lemon elderberry sherbet who said winter desserts can’t be light and refreshing? new this week @sf_frances"
"It's been a joy to watch as pastry chef Sarah Bonar has developed what has now become her signature loaf. With just the right amount of tang, chew and sour, this hearty loaf is impeccably balanced. Ask for it by name!"